Days will be filled by classes on Lindy Hop, Boogie Woogie and Tap, taught by swedish professionals: Lennart Westerlund – chief of "The Rhythm Hot Shots" (TRHS) dance company and International Herrang Dance Camp; Hanna Zetterman – instructor and member of TRHS; also Frida Segerdahl, Halmstad, Sweden and Zakarias Larsson, Stockholm, Sweden, Ursula, Switzeland. 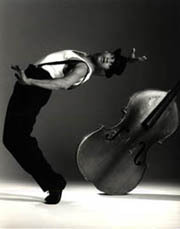 Tap - Genuine and well-known art form based on rhythm, balance and timing. Formed and developed in USA during the late 1800- and forward until the peak around the middle of last century. Events archive for 13 August' 2001. Events archive for August' 2001. Events archive for 2001 year.